I worked in the restaurant business for many years and then became a mom. These two big jobs have one thing in common, washing your hands. Therefore we go through an enormous amount of hand soap around here, especially when the guys are working on bikes, in the yard, or I am crafting or cooking up some country fried goodness. To save money and use clean ingredients we make hand foaming soap for the kitchen and the bathrooms. It is a simple recipe and it makes our bottle of Bronner’s last a long, long time. 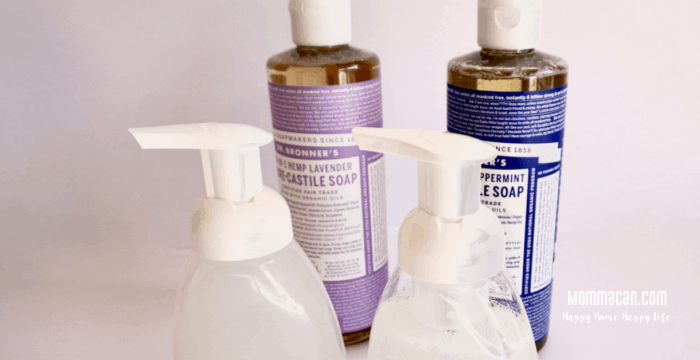 You can make foaming hand soap and save some bucks! Place the funnel into open hand soap dispenser. Pour in 1-2 tablespoons of castile soap. Repeat if you happen to have a huge dispenser. Place lid on top of the dispenser and give it a good shake. Clean and put your tools and soap away and you are finished! If you like this you make also like our Repurposed carafe turn to mouthwash dispenser! Find it here. Wow! I didn’t realize it was so simple to make. Pinning! !